Strikes in Egypt, a strike in Iraq during the "Six Day" War, destruction of the Iraqi Nuclear Reactor and the first MiG-21 shoot down in history via “Netz” (F-16A/B). Throughout the years, the “Knights of the North” Squadron dealt with various threats and participated in various missions, replaced platforms and personnel, but one thing has stayed the same. 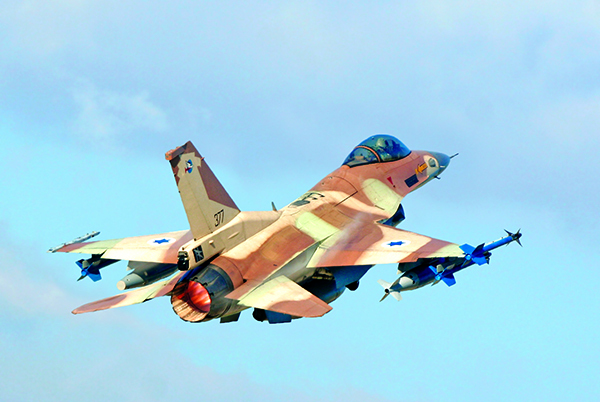 “Above all, the squadron’s special spirit stands out”, said Maj. Gen. Amir Eshel, IAF Commander. “It combines prime professionalism, warmth and a friendship which embraces those who pass through its gates”. 64 years have passed since the “Knights of the North” Squadron was established in 1953, the IAF site goes back to three central events in its history. July, 1965. Col. (Res’) Levi Zur assumed command of the “Knights of the North” Squadron and became the first squadron commander who wasn’t a “Vautour” pilot. The two years that preceded the "Six Day" War were full of operational activity and the “Knights of the North” Squadron, as one of the IAF’s two photography squadrons and the operator of the IAF’s heavy attack aircraft, took a significant part. “We performed photography sorties all over the Middle East and often attacked Syrian posts in the Golan Heights”, recalled Col. (Res’) Zur. “In preparation for the war, we memorized the attack plans and on the morning of June 5th we didn’t need any more briefing”. Col (Res’) Zur was of course referring to Operation “Moked”, a massive preemptive airstrike that targeted the Egyptian, Syrian Iraqi and Jordanian Air Forces and airports. 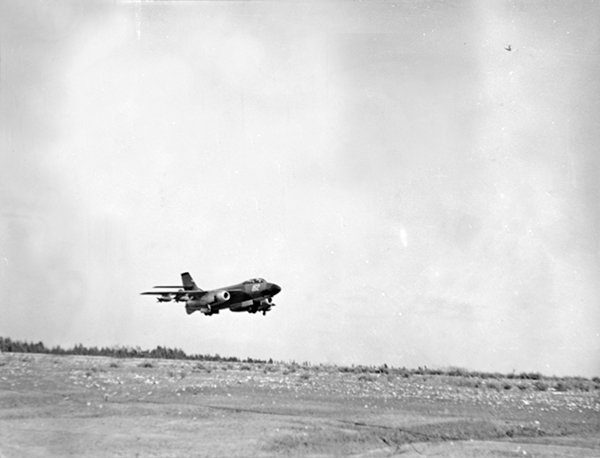 At the time, the squadron operated “Vautour” attack aircraft, which then had the longest range of IAF aircraft and therefore was assigned to attack the farthest airports such as H-3 in Iraq, Luxor and Ras Banas in Egypt. In the Egyptian bases the squadron destroyed Tu-16 strategic bombers which concerned the IAF. The squadron returned to the Iraqi AFB H-3 a number of times, the first to attacks were successful and the aircraft came back safely. The third time, two “Vautours” were shot down. One of the aircraft’s crews (pilot and WSO) was killed and the other aircraft’s pilot was taken prisoner. June 7, 1981. Eight “Netz” (F-16A/B) fighter jets zoomed through Iraq’s skies, en-route to deal a devastating blow to Iraq’s nuclear capability. “In late November, 1980, the IAF Commander called on Col. (Res’) Ze’ev Raz and me. He asked us to prepare ‘Netz’ jets for long range mission. At this point, we didn’t know what the mission was yet”, recalled Brig. Gen. (Res’) Amir Nahumi, former Commander of the “Knights of the North” Squadron and the second formation leader in the operation. “A short time afterwards, we were called upon again. This time they showed us the target and said that there was a governmental instruction to examine a military solutiosn that will bring the advancement of the reactor to a stop”. Sunday, June 7, 1981, 16:01. Four “Netz” jets from the “First Jet” Squadron, four “Netz” jets from the “Knights of the North” Squadron and six “Baz” (F-15) jets for backup are approved to take off. The formation flies low over the Gulf of Eilat, pass over Aqaba and proceed into Saudi territory. The flight was performed in radio silence and the navigation to the target was based on the pilots’ knowledge and maps of the field. “We attacked at 17:00”, recalled Brig. Gen. (Res’) Nahumi. “We estimated that two pilots would abandon their aircraft. Until helicopters would have arrived to extract them from Iraqi territory a number of hours would have passed and a downed pilot’s chances of survival grow at night. We didn’t have night attack systems. We flew with the sun at our back”. “The first bombs we dropped were unique, smokeless bombs, so we would be able to see the target and aim at it. When I dove, I got a good look at the target and released the bombs. I immediately looked and saw that the building had collapsed completely and there was a hold in the ground where it used to be”. On Saturday, October 4, 2003, at 14:10, a suicide bomber detonated in a restaurant in the northern city of Haifa. 21 people were killed in the blast and dozens were injured. “It was clear to me that it was only a matter of time until we would be activated”, shared Lt. Col. (Res’) Ziv, then Commander of the “Knights of the North” Squadron. It was determined that the attack was performed under Syrian direction and the command originated from the “Islamic Jihad” HQ in Damascus. Lt. Gen. (Res’) Moshe Ya’alon, then Chief of the General Staff, instructed the IAF to prepare for an attack in the depth of Syria. By nightfall, the contingency plan became an operational command. 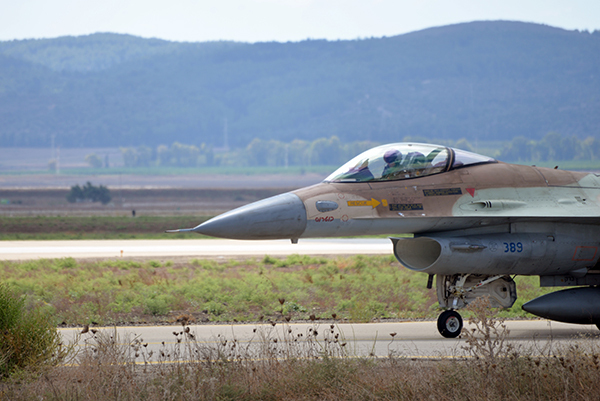 “It was the first operational attack to utilize JDAM bombs”, said Lt. Col. Ziv. “We knew that we were going to perform an attack near the Syrian Capital and prepared for every possible scenario, from anti-aircraft fire to interception aircraft”. Sunday, October 5, 03:00, about 13 hours after the devastating attack. Four “Barak” (F-16C/D) jets armed with JDAM bombs took off from Ramat-David AFB to deep Syrian territory, a few kilometers north-west of the capital, Damascus. The target: an “Islamic Jihad” training camp in Ein Saheb. One after the other, the jets dropped the bombs. “A short time later, we saw the hits, right on target”.